As a big fan of Basketball, it’s a great pleasure for me that you’ve decided to buy a basketball goal system for your sweet home. The main advantage of a portable goal system is its movability and the amazing feature of an in ground basketball hoop system is its rock solid stability. Both the goals are great. 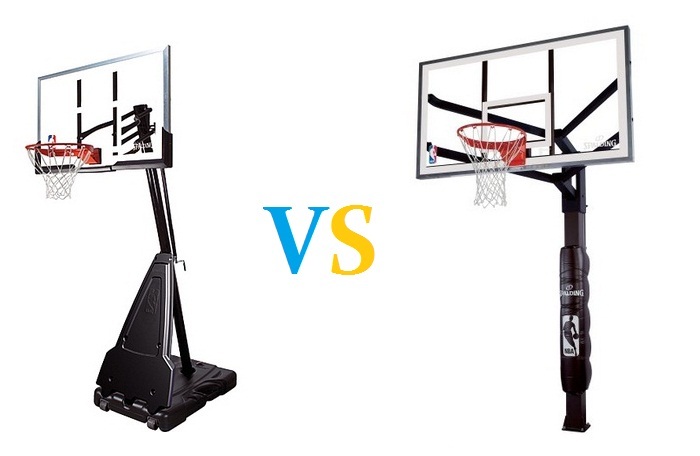 So, most of the new customers fall into prey of a common dilemma that which one will be the best fit for them when they compare in ground vs portable basketball hoop. However, worry no more. Today, I’ll try my best to lead your dilemma to an end. I actually don’t like to criticise or denounce any goal system as I’ve seen both the in ground and portable basketball goals on the best selling list. So, to help you to make your buying decision without wasting much of your valuable time, I’ll represent the key features of both the goals. Hope, you’ll get the most suitable one after having a look on the key features of these two types of basketball goals. If you don’t want to spend much of your time on this boring post, here, you’ll get reviews and links to the most popular basketball systems which aren’t portable but height adjustable except 2 or 3. I’ve actually made every possible attempts to find a great deal for you and it seems to me that in grounds are really superior. I’ve helped a lots of my friends and neighbors to make their decision and also I’ve helped them to install their hoop at the right place. So, I think, I can help you. You know, the best part of making your decision is to find out the best answer of some questions. Are you ready to answer now? If you are looking for systems under $300 to systems over $2,000, you can find them easily on any reputed online retail shops. There’s a little something for everyone there, from budget basketball hoops to the luxury-class models we all wish we could see in our back yard or driveway. Throughout the site of any reputed online shop, you’ll get that they have hand-picked some favorites and bestsellers that provide a solid game of basketball for you and your family (and all the envious neighbors) and you’ll get a lot of companies that are making these fun systems, and they really run the gamut from cheap toys, to training systems for tomorrow’s NBA stars. But, how can you tell the difference between company #1 and #1,001? What should you look for? Don’t worry, I’ll help you to get your answer. How to find a suitable basketball hoop? This really depends on your own intentions and needs. For instance, do you simply want a place to hang out with your kids, clear your head on a spring day, or a place to unwind? Then it really doesn’t need to be an expensive in ground system at all, there are plenty of portable systems on the market that fasten to your home, and they will serve your purpose as you may love to enjoy some fun exercise. But, if you did play college basketball and now you want to train the next generation of scholarship earners, then you’ll need to step it up a bit. Systems range from less than $300 on up to over $2,000 for a rock solid system and you know, portable systems aren’t rock solid. So, I think, you’ve got your answer. Bottom-line, you’ll have to determine your budget, your goals in getting a basketball system in the first place, and you ought to check out the many reviews online from third-party sources like Sporting Goods Info (it’s pretty logical when a manufacturer would have you believe that their goal system is the best system, according to their hand-picked reviews). Your best bet is to find actual reviews and for my part, that’s what I’ve done. I’ve included a number of resources on this site where you can shop several manufacturers and read what customers like yourself have said about what you’re going to buy. 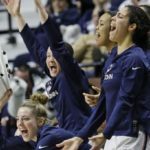 What Are The Main Types Of Basketball Systems? There are several types of systems when it comes to selecting your style of hoops. You can find the details of the most popular 3 types of goals here. The main 3 systems are Wall mount, Portable and In ground basketball goal systems. What does matter with these different systems is how the manufacturers suggest you to install these hoops. There are a few ways that manufacturers can use these 3 main systems for adjusting height on your basketball hoop. The first criteria to consider is if the system is internal, or external. Some will mount the mechanisms internally inside the poles. The thinking (or sales pitch) is that this is more appealing, or that it looks better that way. The other claim is that their functionality is increased on an internally-mechanistic system. This isn’t necessarily the case, nor is it the case that internal mechanisms are safer, either. You may see what is called a lift-assist as well on some basketball goals. The manufacturer has likely used springs to aid in the lifting of the backboard, alleviating some of the weight. The lift-assist systems do make a noticeable difference in ease of use. That’s my personal experience, but consider what would happen if the lift system were to break? That’s the food for thought, it really depends on the manufacturer and their overall quality of construction. Alternatively, on certain crank models, you will note that there are either compression or tension models. This refers to the way the weight relates to the screw. That is, in the compression system, gravity pulls the weight of the backboard in such a way that it pushes down upon the screw. In a tension system, the weight of the backboard pulls on the screw. In other words, the tension systems are easier to lift when adjusting the height of the backboard. The compression systems are usually easier to lower than raise. If this mechanism seems to be so embarrassing to you, then portable system is suitable for you. So, Why In Ground Basketball Goals? In-ground basketball hoops are the permanent systems that are built to last for years and stand the test of time. The main differences between the portable one and in ground system are the price and the durability. So, if you don’t like to buy a new goal hoop every year, then the in ground goal hoop will be the best fit for you. A quality in-ground basketball goal doesn’t have to be a luxury item any more as Lifetime offers this type of durable goal system at the very budget price. You can even get a durable backboard for every price point, whether you want a portable or fixed-pole system. So if it seems like everyone on your block has an in ground hoop, leaving you wishing they’d go on vacation so you can sneak in there for a quick game, don’t worry, you can buy a good one without breaking the bank. You simply need to choose wisely which is what I hope to help you with. 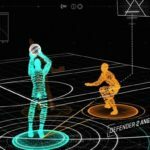 (Make sure you bookmark this website so you can stay on top of the latest in basketball technology: the technology just keeps improving with new materials and design practices.) 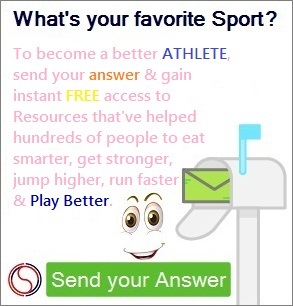 In the meantime, you can save your time as you won’t have to surf the whole web to find the top brands, from Spalding and Lifetime to Goalsetter, Goalrilla and others. 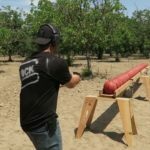 Why should you consider an in ground hoop system? An in ground hoop not only will help your children to have a lot of fun for years, but it is also a good way to get their daily exercise done. So, if you are serious about buying an in ground basketball system that will be around for years, consider the following questions. What size of backboard do you need? In general, the larger the backboard, the better it is. Backboards vary in size from 44-72 inches, which is the NBA’s official standard. The larger backboards make it easier to make bank shots, and other techniques pro players are known for. If you are on a tight budget, then the smaller backboards are more affordable, anywhere from just under $300 on up, but the NBA-reg-sized boards will be (typically) over $1,000. What is the best backboard material? There are 4 main materials that are commonly used in constructing a backboard. Acrylic and plastic (AKA composite or graphite) are cheaper materials, and should not be considered for those looking to practice for league-level play. The main reasons are that the plastic will warp in the sunlight, which will also come back to haunt you. In fact, in most neighborhood’s goal systems you can see how plastic and acrylic systems are great for a while and wind up as sun-damaged, warped junk. Moreover, there’s a problem in the rebound capacity: if a board is warped, then it adversely affects the game play. For a better choice, opt for polycarbonate construction. These backboards perform much like the acrylic models, but offer more durability. Thought theyre better quality than their plastic and acrylic counterparts, they are still more affordable than top-of-the-line backboards. Glass backboards are the most expensive, but for a reason: they offer more responsive rebounds and outlast the other types of backboard construction. What about the quality of the pole? On the more affordable basketball hoops, the pole is usually round and divided up into usually 3 separate sections. Typical construction consists of 16 gauge steel. If you know steel, that’s pretty thin to tell the truth but I’ve seen these systems last for years on end, so it’s really up to you. Around here, people have a keep-up-with-the-Joneses sort of attitude, so neighbor #1 has a portable plastic system that everyone loved. Neighbor #2 decided to upgrade and buy a round-pole, in-ground system. Of course, neighbor #3 went all-out, and bought a system from Spalding. Spalding goals are much like Mammoth, and some of the better Reebok goals and the like. All have 11 or 7 gauge steel poles, which you’d find on things like safes. They Are truly built to last, and their price tags reflect that fact. These top-shelf basketball systems can give years of service, and they are the right models to enjoy the game to the fullest. This question isn’t directly related to your main one. But, I think, this one also will help you to let your kids play smoothly. Clearly you’ll need quality basketballs to play the game. When choosing your basketball, start off with the size you’ll need (either adult or junior). The official NBA size is 29-1/2. If you have mostly children playing, go for the intermediate size of 28-1/2 or some of the junior models which are much smaller for small hands. To keep basketballs from rolling away and this is an important safety consideration especially near roads or subdivisions you should also consider the important investment of a safety net. Most pedestrian accidents occur within a 5-mile radius of home, and kids like to chase after runaway basketballs regardless of personal safety. The safety nets are pretty cheap, and can even attach directly to the basketball rim to keep airballs from rolling down the driveway, into the street, where junior puts himself at risk. Do you have everything for installation? About to 2 bags of cement used for fence posts. Basic hand tools like a drill with necessary bits, wrenches, various screwdrivers, a set of Allen keys (hex wrenches). A 4 or 6-foot level. Digging tools (round-point shovel or better: a post-hole digger). How to Dig the Hole for In-Ground Systems? Before you dig, call the number, around here it’s simply 811, a free service to check for underground pipes and cables. Make sure you’re nowhere near your sprinkler line. Or you could simply call up a local fence contractor, who would basically be installing a large fence post, or a plumber. Installing an in-ground basketball system is generally easy labor. The work doesn’t require a lot of skill to do. In other words: don’t let them take advantage of you, get several quotes. Finally, let’s see a short buying guide for backboards as you may need to replace it after 2 or 3 years of your purchase to bring a new look to your old basketball goal hoop. Check the lower-limit on the height adjustment. The better systems will be able to drop to about 60 or 5 feet for the rim. 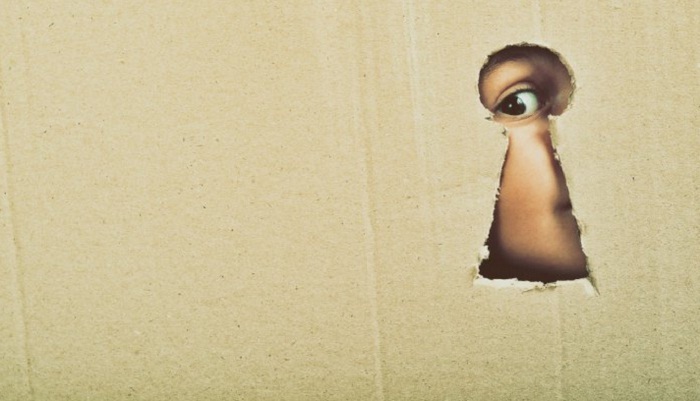 For families with kids, be sure that the system will adjust to accommodate them. Be sure that you can easily adjust the backboard height. If not, you need a lift-assisting mechanism. Look for hoops that are fully adjustable, and beware of systems that have a pin system (with pre-set heights), since these tend to be very low-quality. Some manufacturers offer the option to lock the adjustments in place. If you are buying the backboard for a commercial or institutional use, then this is a recommended feature but not so much for home use. Watch for the warranty language. If the adjuster is exempt from the warranty, this would indicate that the adjustment device will simply not last the lifetime of the basketball goal. If you happen across a system that uses an adjustment rod that is not part of the main body of the post, then thats a sign of lower quality. Food for thought, as the rod may also get lost over time. 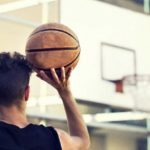 Feel free to visit the other posts of this website which are on skill improvement tips if you like to improve your basketball skills. The benefits of the in-ground basketball goal you see, far outweigh the extra work required to set up. For instance, you won’t have to worry about strong wind or vandals tipping the backboard which surely will occur if you buy a portable one. For the most part, in the comparison between the in-ground vs portable basketball hoop, the in ground systems are built to last for years worth of play. When or if you need a new backboard, safety pads or anything else, your pole is already set. The same is true for the net and rim they can be easily replaced if it’s need. But, you won’t get these advantages in portable systems. So, my recommendation is to get a system that has plenty of options to replace each and every parts separately. In my point of view, i think portable basketball hoops are the best.Why? Bcause in-ground hoops were fixed to grounds and offer a quite stable experience, But being mounted to the same place limited their use. Portable hoops are able of accompanying the families to every place due to roller base desig which can be filled with sand or water.